The City of Tacoma's Environmental Services Department awards Sustainability Small Grants to help educate residents, and protect and restore our environment. A reimbursable maximum award up to $5,000 is open to anyone considering a project within Tacoma city limits**. Projects that help educate residents and/or businesses on the environment and sustainable practices are encouraged to apply. Especially those that focus on protecting and restoring our local environment and quality of life. Strong grant applications will demonstrate a benefit to one or more of the three Environmental Services utilities. Collaboration with other groups, organizations and agencies is highly encouraged. As funding dollars are limited, and due to the makeup of Environmental Services and General Government funding for this grant program, applicants are encouraged to apply early in the year for a better chance at selection. Projects funded with Environmental Services dollars are required to benefit the City's surface water, wastewater or solid waste services. To learn more, check out the Sustainability Small Grant FAQs. Click to view the printable Sustainability Small Grant brochure which includes program information in Spanish, Vietnamese, and Khmer. Projects may be completed in the classroom, in the community or at a business. They also may be located along Tacoma’s numerous community gardens, parks and public spaces. Please note that permits may be required. 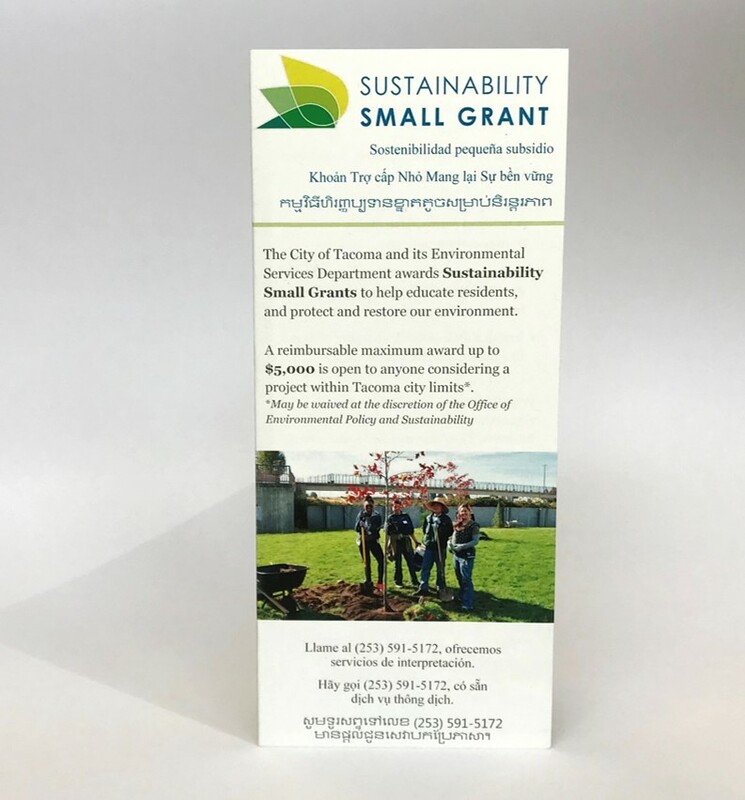 The Sustainability Small Grant program is funded by City of Tacoma General Government and the three Environmental Services' utilities: Surface Water, Wastewater and Solid Waste. For projects related to surface water, look to Make a Splash Stormwater Project Funding. For sponsorship of event related expenses, such as recycling, portable toilets, and temporary bike racks, look to Green Event & Environmental Services Event Support.